“Worlds Will Live, Worlds Will Die: Crisis on Infinite Earths and the Anxieties and Calamities of the Comic-Book Event.” Inks: The Journal of the Comics Studies Society, forthcoming. “Fatal Attractions: AIDS and American Superhero Comics, 1988-1994.” International Journal of Comic Art, vol. 17, no. 2, Fall/Winter 2015, pp. 177-216. “Candy and Drugs for Dinner: Rat Queens, Genre, and Our Aesthetic Categories.” The Oxford Handbook of Comics Studies, edited by Frederick Luis Aldama, Oxford UP, forthcoming. “Lowbrow.” Keywords for Comics Studies, edited by Ramzi Fawaz, Shelley Streeby, and Deborah Whaley, New York UP, forthcoming. “Introduction: On the Whiteness of the American Superhero.” With Martin Lund. Unstable Masks: Whiteness and American Superhero Comics, edited by Sean Guynes-Vishniac and Martin Lund, The Ohio State UP, forthcoming. “White Plasticity and Black Possibility in Darwyn Cooke’s DC: The New Frontier.” Unstable Masks: Whiteness and American Superhero Comics, edited by Sean Guynes-Vishniac and Martin Lund, The Ohio State UP, forthcoming. “‘Am I Doing the Right Thing?’: Milestone Comics, Black Nationalism, and the Cosmopolitics of Static.” Comics Studies: Here and Now, edited by Frederick Luis Aldama, Routledge, 2018, pp. 298-316. “Introduction: ‘What Is This Strange World We’ve Come to?’” With Dan Hassler-Forest. 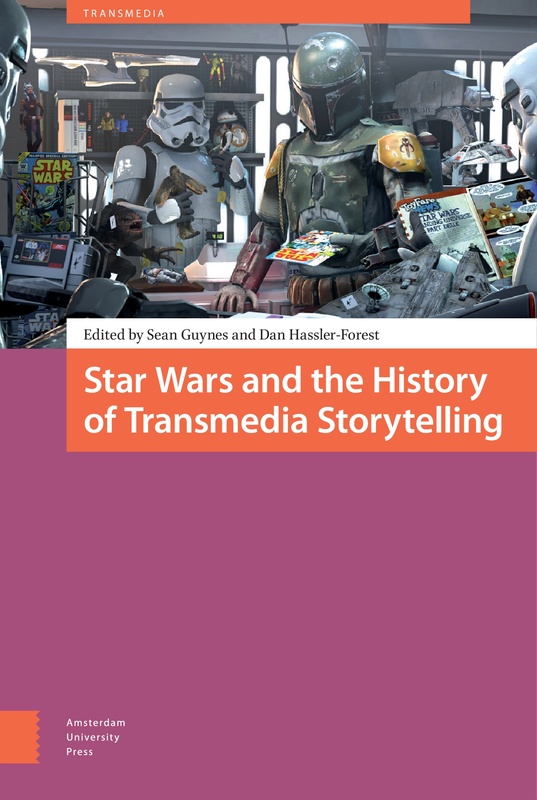 Star Wars and the History of Transmedia Storytelling, edited by Sean Guynes and Dan Hassler-Forest, Amsterdam UP, 2017, pp. 11-13. “Publishing the New Jedi Order: Media Industries Collaboration and the Franchise Novel.” Star Wars and the History of Transmedia Storytelling, edited by Sean Guynes and Dan Hassler-Forest, Amsterdam UP, 2017, pp. 143-154. “The Long, Troubled, Redemptive History of Latinx Superheroes.” PopMatters, 12 Apr. 2019.
Review of Rogue One: A Star Wars Story, directed by Gareth Edwards, Walt Disney Studios, 2016. Science Fiction Film and Television, vol. 12, no. 1, pp. 161-165. “Selling Afghan Authenticity: Jamil Jan Kochai’s 99 Night in Logar.” PopMatters, forthcoming. Review of Black Leopard, Red Wolf, by Marlon James, Riverhead Books, 2019. World Literature Today, vol. 93, no. 2, Spring 2019, pp. 80-81. “Motherhood and Soviet Life in Nora Ikstena’s Latvian Novel.” PopMatters, 15 Mar. 2019. “Afrofuturism’s Specter: Alternate History, Racial Capitalism, and Nisi Shawl’s Everfair.” SFRA Review, vol. 327, Winter 2019, pp. 48-51.
Review of Migrant Futures: Decolonizing Speculation in Financial Times, by Aimee Bahng, Duke UP, 2018. ASAP/J, 21 Feb. 2019. “Inventing the Alien in Early Science Fiction.” Aliens in Popular Culture: A Guide to Visitors from Outer Space, edited by Michael M. Levy and Farah Mendlesohn, Greenwood Press, 2019, pp. 3-8. “Terryl Whitlatch.” Aliens in Popular Culture: A Guide to Visitors from Outer Space, edited by Michael M. Levy and Farah Mendlesohn, Greenwood Press, 2019, pp. 301-303. “Academic-Led Publishing and the Necessity of Open Access; Or, Remembering Aaron Swartz.” Michigan Publishing News, 1 Feb. 2019. “The Art of Typography and Design in Science Fiction Film.” PopMatters, 30 Jan. 2019. “On the Queer Millennial Greenlandic Novel.” PopMatters, 22 Jan. 2019. “Fracturing to Survive in Tanya Tagaq’s Split Tooth.” PopMatters, 17 Jan. 2019. “The Zombie and Its Metaphors.” American Quarterly, vol. 70, no. 4, Dec. 2018, pp. 903-912. “We’re All Dürt Würkers: Grady Hendrix’s Heavy Metal Horror.” Los Angeles Review of Books, 9 Jan. 2019. “She Would Be King, An Afrofuturist Novel of Nation-Making in Liberia.” PopMatters, 8 Jan. 2019.
Review of Monsters in the Machine: Science Fiction Film and the Militarization of America after World War II, by Steffen Hantke, UP of Mississippi, 2016. Extrapolation, vol. 59, no. 3, pp. 307-310. “Saving Acid Communism: 800 Pages of the Essential Leftist Critic Mark Fisher.” PopMatters, 4 Dec. 2018. “The One About the One About Friends.” PopMatters, 30 Nov. 2018. “The Book about Geek Triumph You Probably Don’t Need.” PopMatters, 26 Nov. 2018.
Review of Mecha Samurai Empire, by Peter Tieryas, Ace, 2018. Strange Horizons, 21 Nov. 2018. “Alyson Hagy’s Scribe Is Gloriously Artful, but Something Is Missing.” PopMatters, 15 Nov. 2018. “When Sexually Frustrated Angry White Men (Mis)Read the Classics.” PopMatters, 9 Nov. 2018.
Review of Twenty-First-Century Popular Fiction, edited by Bernice M. Murphy and Stephen Matterson, Edinburgh UP, 2018. Fafnir: Nordic Journal of Science Fiction and Fantasy, 2018, pp. 66-68.
Review of Unholy Land, by Lavie Tidhar, Tachyon, 2018. World Literature Today, vol. 92, no. 6, Nov. 2018, pp. 69-70. “‘I’ve Waited for Him’: How Halloween (2018) Turns the Tables on the Slasher.” We Are the Mutants, 31 Oct. 2018. “Audrey Schulman in the Gutter of Genre.” World Literature Today Blog, 18 Sep. 2018.
Review of Ball Lightning, by Cixin Liu, Tor, 2018. Featured review. World Literature Today, vol. 92, no. 5, Sep. 2018, pp. 66-67. “The Cursed Frontier: Ismail Kadare’s Theory of the State.” PopMatters, 7 Aug. 2018. “Mame Bougouma Diene and the Promise of African Horror.” World Literature Today Blog, 24 July 2018.
Review of Luminescent Threads: Connections to Octavia E. Butler, edited by Alexandra Pierce and Mimi Mondal, Twelfth Planet Press, 2017. Utopian Studies, vol. 28, no. 2, pp. 280-284.
Review of Condomnauts, by Yoss, Restless Books, 2018. World Literature Today, vol. 92, no. 4, July 2018, forthcoming. “Colonial Hottie: Gal Gadot, Wonder Woman, and Brand Israel.” The Middle Spaces, 5 June 2018.
Review of Feathered Serpent, Dark Heart of Sky: Myths of Mexico, by David Bowles, Cinco Puntos Press, 2018. World Literature Today, vol. 92, no. 3, May 2018, pp. 89-90. “Introduction: On Punking Speculative Fiction.” Punking Speculative Fiction, edited by Sean Guynes-Vishniac, special issue of Deletion, vol. 14, May 2018. “Mutate or Die: Eighty Years of the Futurians’ Vision.” Los Angeles Review of Books, 14 Apr. 2018.
Review of Essays on World Literature: Aeschylus • Dante • Shakespeare, by Ismail Kadare, translated by Ani Kokobobo, Restless Books, 2018. World Literature Today, vol. 92, no. 2, Mar. 2018, pp. 89-90.
Review of A Girl in Exile: Requiem for Linda B., by Ismail Kadare, translated by John Hodgson, Counterpoint, 2018. World Literature Today, vol. 92, no. 1, Jan. 2018, p. 66.
Review of Her Body and Other Parties: Stories, by Carmen Maria Machado, Graywolf Press, 2017. World Literature Today, vol. 91, no. 6, Nov. 2017, pp. 69-70.
Review of Mapping the Interior, by Stephen Graham Jones, Tor, 2017. World Literature Today, vol. 91, no. 5, Sep. 2017, pp. 70-71.
Review of The New Mutants: Superheroes and the Radical Imagination of American Comics, by Ramzi Fawaz (New York UP, 2016). Journal of the Fantastic in the Arts, vol. 27, no. 3, Sep. 2017, pp. 532-535.
Review of Happily Ever After: The Romance Story in Popular Culture, by Catherine M. Roach (Indiana UP, 2016). The Journal of Popular Culture, vol. 50, no. 4, Aug. 2017, pp. 898-901.
Review of Dissolving Classroom, by Junji Ito (Vertical Comics, 2017). World Literature Today, vol. 91, no. 3-4, May-August 2017, pp. 99-100.
Review of The Unique Legacy of Weird Tales: The Evolution of Modern Fantasy and Horror, edited by Justin Everett and Jeffrey H. Shanks (Rowman & Littlefield, 2015). Journal of the Fantastic in the Arts, vol. 27, no. 2, Mar. 2017, pp. 332-334. Quarterly editorials in SFRA Review since summer 2018. “Fiftieth Anniversary Best Essays.” Co-written with Ann Larabee, et al. The Journal of Popular Culture, vol. 50, no. 5, Oct. 2017, pp. 919-928.